I saw an Instagram post of a friend and her boys while playing at the Altitude Trampoline Park in Bloomington. It looked like a great time. We decided to spontaneously visit on a recent Saturday. See, social media is good for something! 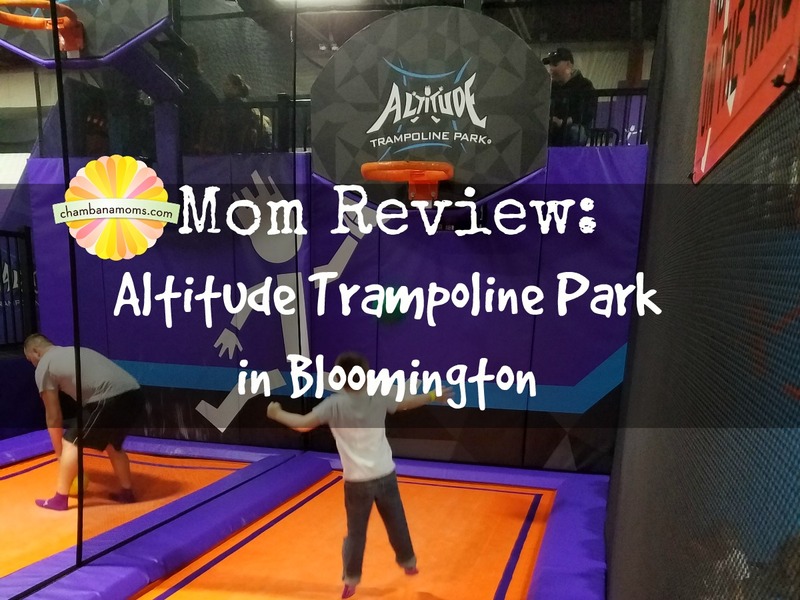 They are open Monday through Thursday 10 a.m. to 9 p.m., Friday/Saturday 10 a.m. to 11 p.m. and on Sunday from 11 a.m. to 8 p.m.
From our Savoy door to the trampoline park it took us 48 minutes. It was a fast, easy I-74 drive. Take the Downs Exit. Once you get off, you skirt the edge of town past the airport and you are there—1702 General Electric Rd., Suite #4. The parking lot was packed, but we lucked out with a pole position spot. So far, so good! First thing, you go to a computer and fill out waivers. (They are valid for a year.) Then you go pay. OK, so looking at the total bill, it’s a bit pricey—almost $75. However, if you look at it hour by hour, it doesn’t sound so bad. 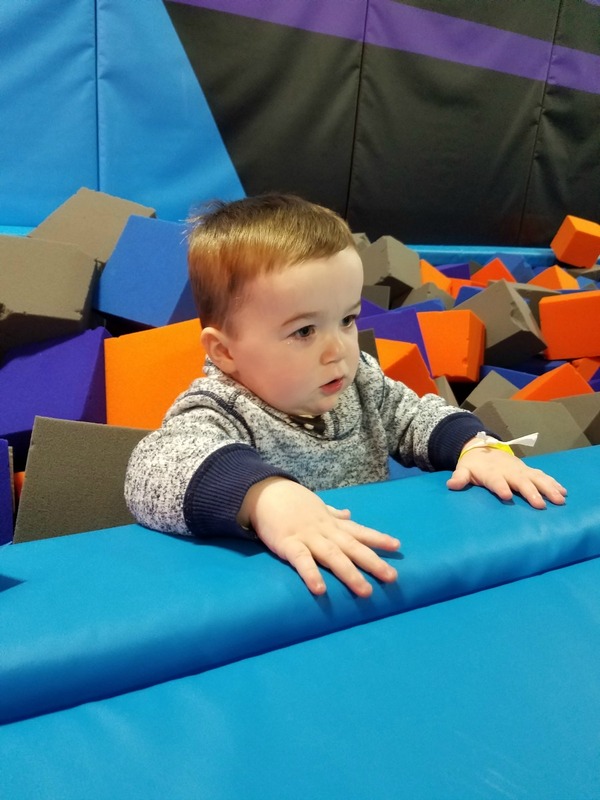 It’s $14.95 for an hour of jumping—which was plenty of time for a little kid, a toddler and two pooped parents. Add on the mandatory $2 grippy socks, like the ones you get in the hospital, and your bill adds up. (Keep these suckers! Use them again.) You can jump for 1.5 hours for $19.95, $22.95 for 2 hours, $29.95 for 3 hours. You can bypass any lines, and you can complete online! After you enter, you can pay for secure lockers or there are open cubbies to hold your stuff for free. It was a Saturday night, and it was crowded. Crowded with mostly elementary to middle school kids. We were on the young side for sure. 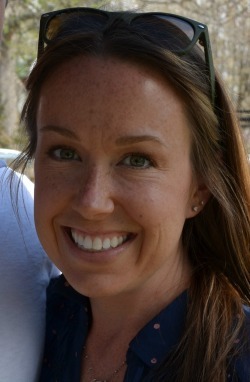 Even though it was crowded, I never felt like it was too much on the actual trampolines. I was never running into anyone. However, a little girl doing cartwheels did kick my older son in the head. Granted he was (unknowingly) jumping at the end of a tumble track. It was all momentum and flying limbs. The rules state—don’t sit/rest on the trampoline areas. You got to keep it moving or you might get trampled. Pun intended. When you buy your passes, you are lumped into time slots by color wristbands. That’s how they keep track of when your time is up. (When your time is up, they call your color over the loudspeaker.) Great system. Now, I spent the first 15 minutes of our hour waiting for the changing table in the bathroom. Of course, our toddler pooped as soon as we go there. During my wait, it occurred to me that these sock-footed people are walking on this bathroom floor before jumping on trampolines that my kids are face planting on. Hmmmmm. 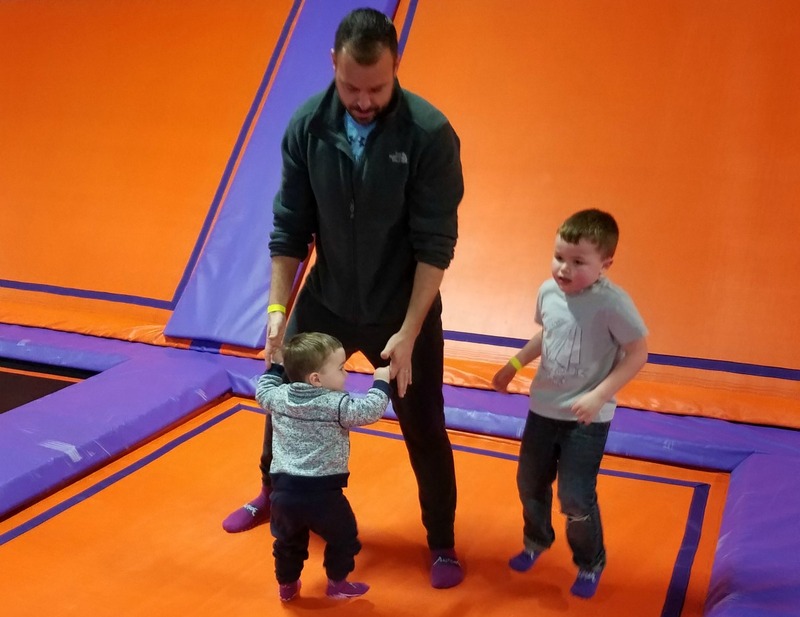 Finally, my toddler and I met up with my little boy and husband, and they were having a blast on the performance trampolines. These are basically a series of trampolines that have slanted edges you can push off of. There are staff members monitoring the jumpers. Have you ever been in a pool, and the lifeguards are constantly blowing their whistle? It really takes away from the fun of the experience. I was relieved that the staff weren’t chronic whistle blowers. They really let the kids have fun. Everyone still stayed safe, too. There are other areas in the 30,000-square-foot park, too. Visit them all! I started on the performance trampolines holding my toddler’s hand. I would also hold him in my arms and jump. This way it felt like, to him, he was jumping. He laughed and laughed. Full disclosure, people kept looking at him throughout our visit. At first, I thought it’s because he’s so cute. I started looking around, and it occurred to me they are probably thinking he’s so small. Granted, he’s not frail by any means. Although, he is probably on the young side. I would say 3 is probably the youngest I would go. There are no official age requirements. It’s up to the parents. Supervision is always encouraged. If this makes you apprehensive, maybe try the toddler time! Monday through Friday, 10 a.m. to 1 p.m. I immediately felt like a kid again. It was so fun (for us and them) to let go and just jump. There’s nothing better than finding an activity you all like. The upbeat pop music helps increase the enjoyment. I did notice there were not that many adults jumping. (There are massage chairs for the smart parents.) Well I can tell you why—this activity moves muscles you didn’t know you had. We were both sore the next morning. As for women who have given birth—trampolines make you pee. Take that information and do with it what you want. You have been warned. I would also make sure to wear workout clothes. You may break a sweat, and you will really be working your bod. Try their Saturday and Sunday, 8 a.m. fitness classes! They are $10 each. OR seven classes for $50. Also, their birthday parties looked like so much fun! Make the trip for your next birthday party! Each party has a dedicated dodgeball game for party guests only. (Otherwise jumpers must wait in line to play.) The parties take place in an awesome party room. The room is below the loft area that hold tables and chairs where people can eat. There is a snack bar with standard concessions fair—with one exception. Avanti’s Gondola sandwiches are served! We went to the Italian Avanti’s Bloomington for dinner instead. It is super close to the trampoline park, too. Highly recommend! Inexpensive, fast, delicious Italian food. As an Illinois State alumna, this was our fancy place to eat in college. Full circle—bringing kids here is great, too. I felt a sense of jealousy over this place not being in the Champaign-Urbana community. Stay tuned for updates.